Crude oil rallied alongside other commodities and the euro to its highest in three months last week on NYMEX, mostly from market’s expectation of new Euro Zone bailouts and a third round of quantitative easing from the U.S. Fed. On the crude oil side, although crude stockpile has gone through four consecutive weeks of draw, it is still above the 5-year range (See Chart Below). Moreover, as we are heading into the slow demand season of the year, inventory most likely will start to build again. Inventories of gasoline (and diesel) in the U.S. are at their lowest levels for this time of year since 2008 (partly due to recent refinery fires and the closing of some refineries in the Northeast). Gasoline futures have soared 19% over the past two months as traders seem to be betting that prices of gasoline and diesel will continue to rise. Pump prices typically lag behind the futures market by several weeks. However, America’s demand for fuel dropped to the lowest July level since 1995, plus the summer driving season is nearing an end, which will lead to even lower gasoline demand. Furthermore, domestic refiners have significantly ramped up fuel exports. For the first seven months of the year, exports were 14% higher than during the same period in 2011, according to API (American Petroleum Institution) data. What that means is that there are more product supply could be diverted for domestic use. And even if there’s a real shortage for whatever reason, refiners can draw more oil from the abundant stockpile. Top Asian buyers — China, India, Japan and South Korea together take more than half of Iran’s crude oil exports — have worked around the European Union embargo, suggesting imports will stay at least around these levels for the rest of the year. South Korea joined its Chinese counterparts by asking Iran to deliver crude on Iranian tankers, government and industry sources said. This shifts to Tehran the responsibility for insurance, sidestepping the EU ban. Indian refiners have adopted a twin plan to deal with the insurance issue. They are seeking government approval to ask Tehran to deliver the oil, and are trying to use limited cover from state-run insurers for locally-owned tankers to ship it. Growth in emerging economies in Asia, particularly China, has been the main driver of oil-demand growth in recent years. However, currently, there’s no such compelling story of strong demand and supply shortage that drove oil price to 2008 highs. Although the supply and demand factors do not seem to support the current price levels in crude and gasoline, there are plenty of other events to sustain and add the risk/fear/speculation premium. The worse-than-forecast tropical storm Isaac is expected to strengthen to a Category 2 hurricane and hit the Gulf Coast at midweek disrupting refineries and offshore oil production. Crude and gasoline futures already partly reflected this risk premium. 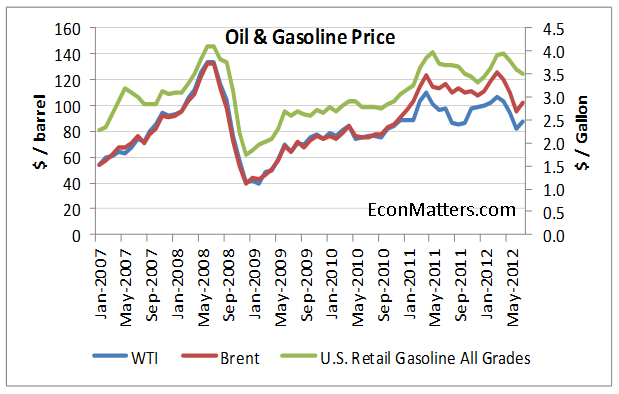 US gasoline prices could really spike if any of the refineries are off line. Petroleum Economist cited unnamed sources on Friday that IEA has agreed to a coordinated SPR (Strategic Petroleum Reserves) release with the U.S. in September. However, during the IEA coordinated SPR release last summer (due to Libyan civil war), oil price managed to climb back to where it was before the release in just eight days. Federal Reserves Chairman Bernanke’s often times market-moving speech at Jackson Hole meeting on Aug. 31. New bailout and stimulus package development from the Euro Zone and/or China. EIA estimated that for every $1 per barrel change in oil prices, consumers are expected eventually to see a 2.4-cent-per-gallon change in retail gasoline and diesel prices, if everything else remains the same. Unfortunately, these events mentioned above, with the exception the SPR release (the price effect will be temporary), could be enough to keep crude and gasoline at or above current price levels in the near term.